Whether you’re casting, jigging, or trolling, spring lake trout fishing in northern Michigan is always exciting and fun! Lake trout can be targeted on the Grand Traverse Bays, Lake Michigan, and select inland lakes. Bass fishing in northern Michigan during the spring is an experience every avid bass fisherman should have! Enjoy fishing in our gin-clear waters with an active smallmouth bass bite throughout the day. Michigan’s rivers offer fantastic spring steelhead fishing opportunities for anglers. Let Sport Fish Michigan’s Captains and Guides provide you with a great day of fishing on northern Michigan’s beautiful rivers! 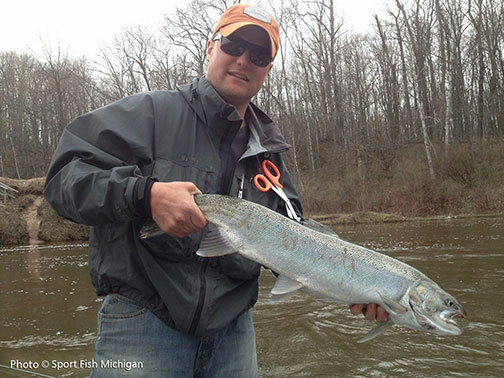 Wintertime fishing on northern Michigan rivers usually means steelhead to most diehard anglers. Fishing pressure is low, the rivers have a beautiful serenity about them, and it’s just an awesome time to be out on the water chasing steelhead that are spending their winter in the rivers. Not to be overlooked, however, is the amazing trout fishery that we have on the Manistee. Sure, they probably won’t break any records for size, but what they lack in that category, they more than make up for in scrappiness, willingness to bite, and beauty. Not to mention that they’re just plain fun to catch on light tackle. The Michigan DNR stocks tens of thousands of brown trout at Tippy Dam on the Manistee River each spring, and these fish grow to be anywhere from 10-15 inches by wintertime. And this doesn’t take into account the trout that have been stocked in previous years. Fish over 20 inches aren’t uncommon. Steelhead smolt and resident rainbow trout are also in these waters. For a fun day of fishing, this is an amazing fishery, and when other species aren’t biting, the trout bite can be downright hot! Experienced anglers and novice anglers alike can benefit from a fishery like this, and we at Wolfe Outfitters feel blessed to have this fishery in our backyard! On a recent chilly December day (ok, it was downright cold—10 degrees to begin the morning), one of my fellow Wolfe Outfitters guides and I headed down to the Manistee River to get in on the trout fishing. After all, what do guides do on a day off? We go fishing! Taking a two-pronged approach, I had a jig and waxworm setup (also a key steelhead option for winter and spring) while my fellow guide, Jeff, had his fly rod with a couple of prototype flies to try. Launching the boat at Tippy Dam, we headed out to some likely looking holding water. Jeff brought his 4-weight rod, which is perfect for the brown trout that hold in this water. I had a medium light 10-½ foot baitcasting rod with which I love to float fish for trout and steelhead. It took us a little while to dial in exactly where the trout were, but we found them. Tucked bankside to a seam in the river just below a gravel bar, we found the perfect spot to cast—both with my jig and waxworm setup, and Jeff’s prototype flies. Multiple doubles became the norm in the scant 2-½ hours that we fished. Needless to say, the waxworm program worked extremely well, and Jeff was thrilled to find a prototype that needs to be included in the regular rotation! “I guess I’ll be spending some time tying up a lot more of these!” he said as he grinned. I don’t know of too many places where an angler can go have fun on a river enjoying a fishery like the Manistee River just below Tippy Dam. Spring, summer, fall, and winter, the brown trout fishing is dynamite. It’s a great place for anglers to learn a new technique, or to just have fun like Jeff and I did. The trout won’t win prizes for size, but they certainly should for putting a smile on people’s faces. They are truly beautiful specimens that have a tenacity and scrap to them that makes them a hoot to fish for. Fly fishing or conventional gear fishing techniques both work, and with a numbers fishery like this, who can complain?!! 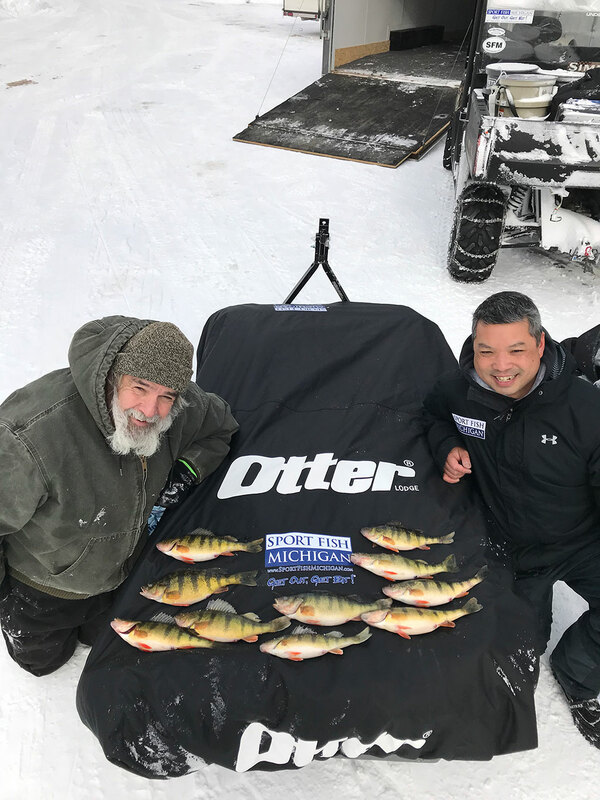 Ice has covered many of the northern Michigan inland lakes, and the itch to get out onto the ice for some ice fishing is growing stronger each day. 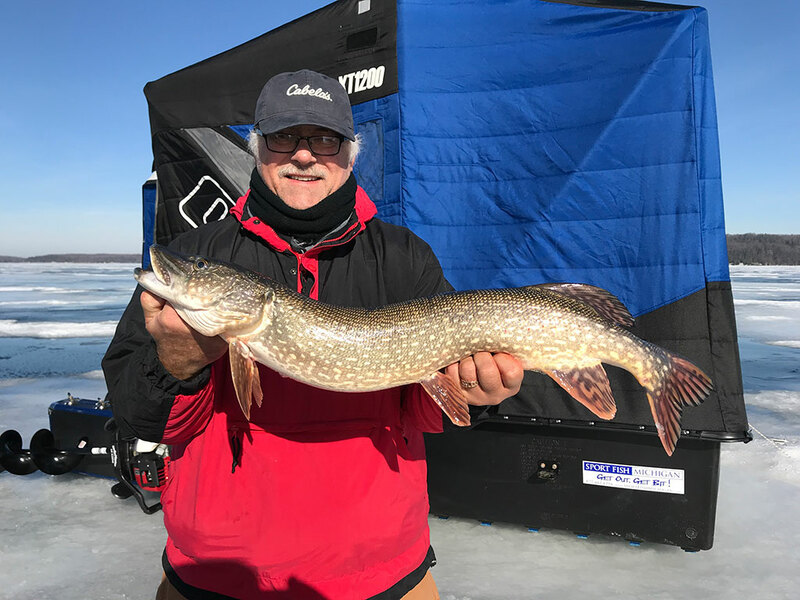 The thrill of fishing through the ice is undeniable, and as we get ready for the upcoming winter ice fishing season, now is a good time to go over a few safety precautions. Early ice can mean some of the season’s best angling opportunities, but it also brings with it a lot of risks. In fact, just 2 days ago, the US Coast Guard had to rescue somebody from the middle of a Traverse City area inland lake. There are a tremendous amount of factors that can determine not only the thickness of the ice, but more importantly, the strength of the ice. Ice is not all created equally, and this can lead to variations in strength. It is known that the strongest ice is hard, clear ice that has been formed with uninterrupted cold, and calm days and nights. The clearer the ice, minus any snow or bubbles, the stronger the ice is, and thus the higher its capability to hold weight. If the ice is milky or chalky in color, the strength of ice must be considered to be much weaker than if it is clear “black” ice. This is because air bubbles and snow make for very porous ice, which is not solid in nature. While we have had quite a few cold nights so far here in northern Michigan, we have had a lot of wind. This has slowed ice production, and also created weaker ice. Do not venture out onto the ice on anything less than 2 inches of clear, hard ice. Very often, with 2 inches or less of ice covering a body of water, there will be soft spots where the ice didn’t freeze uniformly. Be aware of things that can lead to soft or thin ice: underwater springs, underwater currents, or even snow will slow the formation of ice. The bigger a body of water, often times, the more current is present. Similarly, moving bodies of water like rivers and streams may be more likely to have unstable ice. We want at least 4 inches of hard, clear ice before walking out onto the ice to go ice fishing. 4 inches is the accepted minimum for many authorities, including the Minnesota Department of Natural Resources. This accepted minimum not only has greater strength, it also helps to account for possible weak spots where the ice may not be uniform in thickness. 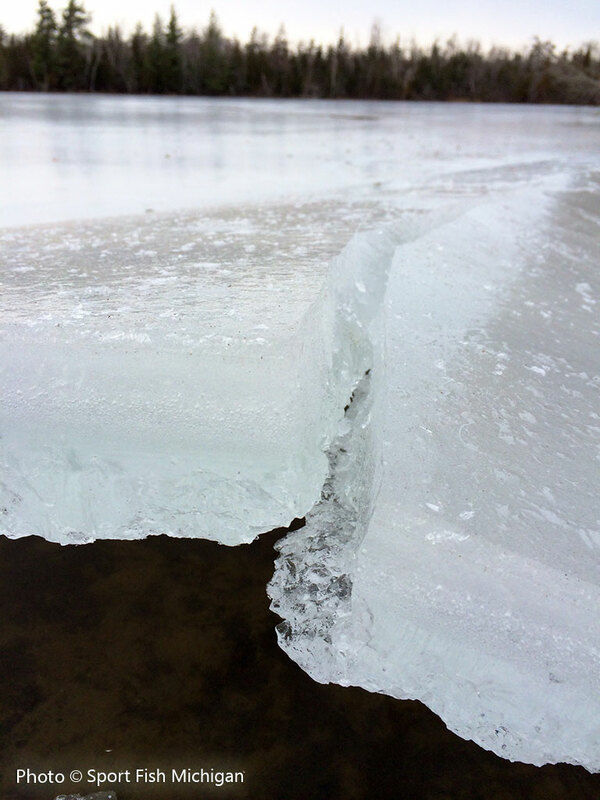 Ice thickness in one area of a lake may not be the ice thickness in another area of a lake. For instance, ice in the middle of a lake may have formed later than ice nearer to shore, and in most cases will be thinner. Wind has a great affect in ice thickness. In early ice formation, wind will blow frozen skim ice from one side of a lake to another, creating a slightly thicker ice where the wind pushed the ice together. Snow is a great insulator, and makes for poor ice formation. Newly formed ice that is mixed with snow can be extremely unreliable. Many authorities and studies have deemed that snow ice is roughly 50% of the strength of clear ice. A stationary weight on the ice needs greater strength of ice than the same weight if it is moving. This simply means that while a layer of ice may support a person moving across the ice, it very well may not support that same person if they were stationary in one place. Weight distributed over a wider area is better than weight distributed in a smaller area. Never venture out onto the ice without informing others of your plans. Always take caution, and have a plan ready should there be a breakthrough. The Minnesota DNR uses the following table for a very rough guideline for new, clear ice. 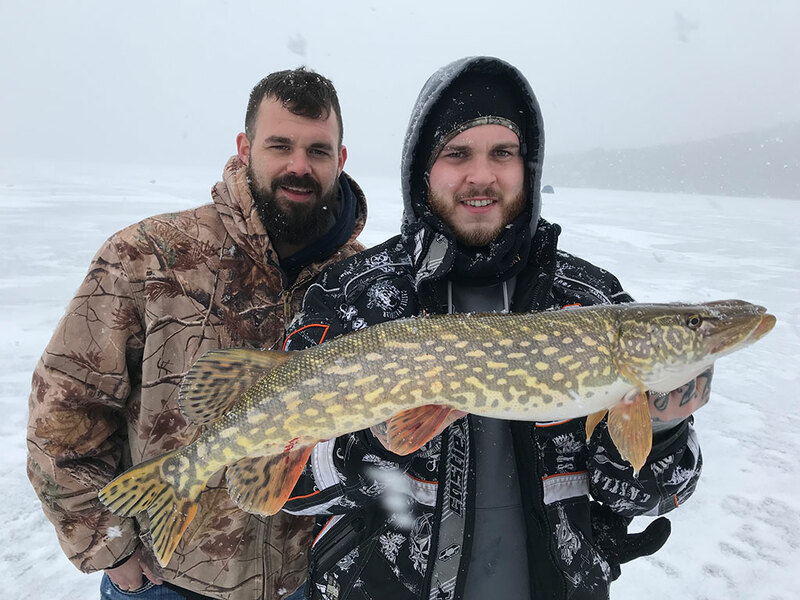 We can’t wait to begin this season’s guided ice fishing trips here at Sport Fish Michigan, but with the above in mind, we will be content to be patient. Sport Fish Michigan’s ice fishing guides are all fishing fanatics, but despite the itch to get out onto the ice, we will wait a while longer until we venture out. I would much rather wait for safer, thicker ice to satisfy my ice fishing passion than to head out onto iffy ice, risking much more than just getting my boots wet. Fishing’s supposed to be a fun experience, not a harrowing experience. Stay safe, have fun, and we’ll see you out on the ice! This coming Saturday is the opening of the deer season for many who hunt, and the woods will be full of people anxiously hoping for a shot at a trophy buck. A couple of recent snowfalls have hunters giddy with anticipation. Indeed, this is a great time to be hunting in the beautiful state of Michigan, as the woods and waterways are full of life. Ducks and geese are plentiful as they head south for the winter. Squirrels are busying themselves for the winter, foxes are calling out to mates, bears are on their last few feeding binges before bedding down to hibernate, and turkeys are abundant, scratching the ground for a morsel. And then, of course, there are the deer. Lots of them. Despite much of the attention for the outdoor enthusiast now being focused on hunting, this is still a wonderful time to be on the water. Lake or river, there are some terrific options, and competition for a fishing spot is almost non-existent. 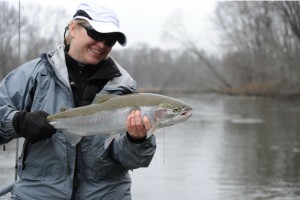 Steelhead are in the rivers now, and where it’s still an open season, such as the lower Manistee River below Tippy Dam, the trout bite is fantastic this time of year. Rainbows and browns gorge themselves in preparation for the winter, and anglers can have lots of fun targeting these beautiful and scrappy fish. Lake run brown trout enter the rivers to spawn, as do lake trout in certain systems. Cured or fresh salmon spawn tied into spawn bags will get bites from all of the species just mentioned, and when the bite is on, it’s easy to run out of spawn bags. Light jigs tipped with wax worms can also be a great option when fished under a float. Those anglers preferring to fish the numerous inland lakes here in northern Michigan have great options as well. Perch are biting this time of year, as are most of the predatory species like bass, pike, and walleye. Walleye fishing is getting better and better as the days shorten, providing great opportunities for anglers fishing at early light and the last light of the day. The same goes for pike. Bass tend to feed a bit better after the sun goes up a bit. Blade baits, like the Heddon Sonar, can score extremely well this time of year, and it’s not uncommon to catch walleyes, perch, and pike on these baits as well. Whitefish begin to come shallow on waters like Grand Traverse Bays, and even though the lake trout season is closed on the Bays, it’s very possible to hook one of these fun fish while fishing for whitefish. Just throw them back to stay legal! Whitefish bites are usually very light, but well worth it for this outstanding tablefare. The fall feed is on, and the bite can be downright hot, despite some of the colder temperatures associated with the opening of deer season in Michigan. A couple of days ago, I had a rare opportunity when one of our Wolfe Outfitters trips was cancelled at the last minute, and I had a free day. My Wolfe Outfitters guide, Matt, and I went fishing. We took Janice with us – the Recreation Manager at Crystal Mountain Resort, and the woman with whom I worked to create Wolfe Outfitters’ partnership with Crystal Mountain Resort. A slight warming trend made for a nice day out on the water. Add in that we didn’t get to the ramp until after 10am, and we were relaxed and ready to go! Why not be more informal and relaxed when it comes to fun fishing? Janice even made our lunches the previous evening to be heated on Matt’s on-board grill. November steelhead tend to relate to a few different patterns. Cured salmon eggs tied in spawn sacks and round-bodied crank baits dominate for gear anglers. Fly anglers have options such as beads, nymphs and streamers. Depending on water temperatures, the king salmon that run the rivers have likely ended their spawn, and the steelhead that gorge on the eggs in the river now have to find another food source to sustain them throughout the remainder of fall and winter. The single egg pattern holds up well throughout winter, but it isn’t as effective as other techniques, as the salmon eggs are no longer prevalent in the river. However, spawn sacks offer tempting scent and life-like softness that even picky steelhead oftentimes just cannot pass up. During the mid-fall period when the salmon have finished spawning, and the steelhead are still active with warmer water temperatures, throwing round-bodied crank baits can be an absolute blast. Similar to throwing longer bodied crank baits for king salmon, the technique is the same. Casts are made downstream, close to the bank and to cover (holding water). A medium retrieve, allowing the deep diving baits to work their magic as they are pulled through seams and creases induce violent strikes that anglers thoroughly enjoy. Medium weight rods are used to cushion these aggressive takes, yet have enough backbone to turn large steelhead away from logjams and snarly cover. For big steelhead on the Big Manistee River, I use 20 pound braided line, and either 14-pound fluorocarbon leaders or 12 pound, if the conditions are really clear and the flow is low. Fluorocarbon has the same refractive index as water, and is nearly invisible to fish. Steelhead often strike out of a feeding response, and looking as natural as possible is a huge advantage for my guide customers and me. I’m glad that we were able to get out, even if it was for only 3 hours of fishing. We had a number of bites, and were able to land some beautiful Manistee River steelhead. And cooperatively mild weather made it all that much sweeter! It was nice to fish with good people, and experience the fun of fishing for oneself for a few hours. Does casting crank baits using spinning gear or casting flies for steelhead sound like fun? I can guarantee you that it is. And with one of the world’s premier steelhead fisheries at our doorstep, Wolfe Outfitters is ready to get you out on the water for your own adventure. Happily, I just had mine! During the cold winter months, it’s down right cold, and the motivation to head out of a warm house to go fishing is difficult to say the least. Two of my guide services are still in operation during these cold winter months—Manistee River Salmon Guide Service and Wolfe Outfitters, and we’re happy to brave the cold with our customers. Sure, motivation for us to leave the comfort of our homes and trucks is tough too, but usually once we’re out on the water casting, enjoying the day with our customers, things don’t feel as cold. Despite the chilly temperatures, the Big Manistee River doesn’t usually freeze over due to its big flow, and there is often fishable water for the beautiful steelhead all winter long. 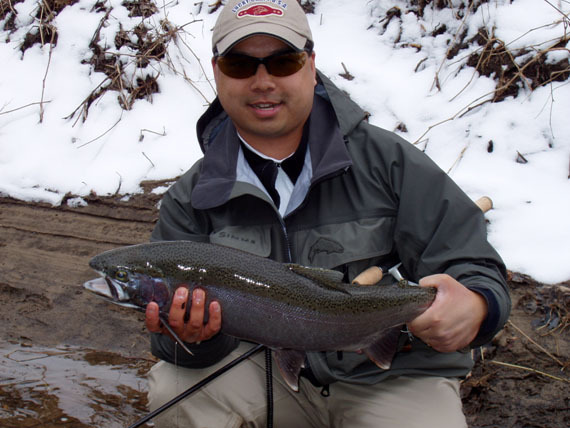 And one of the most enjoyable things about winter steelhead fishing is the relative lack of fishing pressure. It’s not uncommon to go all day without seeing another angler. The quiet solitude of winter fishing is a true joy, and most customers are thrilled to see the river without much other fishing pressure. And the fishing can be absolutely hot, even if the temperatures are cold. 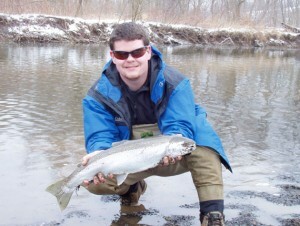 Many a snowy day have we experienced tremendous fishing for steelhead on the Manistee River and other area rivers. Not only does the sight of a chrome steelhead warm the blood, battling these acrobatic fish also gets the body moving, and the adrenaline up. During the dead of winter, steelhead don’t maybe jump as frequently as during the fall, but they still jump and run, thrilling anglers of all ages. Manistee River Salmon Guide Service is suited with a custom jet sled that can utilize much of the river, searching for active fish. And with my USCG Captain’s license, I can legally fish my customers in the lowest stretches of the river, where some fish tend to hold in the deep, slow pools. A plus for the Wolfe Outfitters guide service is that it is based out of Crystal Mountain Resort. This makes for a comfortable retreat after a cold winter’s day of fishing. Spa services, a heated pool and a couple of nice restaurants are just some of the more pampering amenities offered by Crystal Mountain Resort. Not to mention that it’s a fantastic ski resort as well! There are lots of ski runs catering to both downhill skiers and groomed runs for cross-country skiers. What a great way to combine either a fishing and skiing trip with the guys, or pile the family into the comfortable rooms for a winter get-away! Crystal Mountain Resort has just about everything on-site, and is done in a first class and stunning fashion. We are proud to have partnered Wolfe Outfitters with a resort like Crystal Mountain Resort. Just because the weather has turned chilly doesn’t mean that the fishing has cooled down. 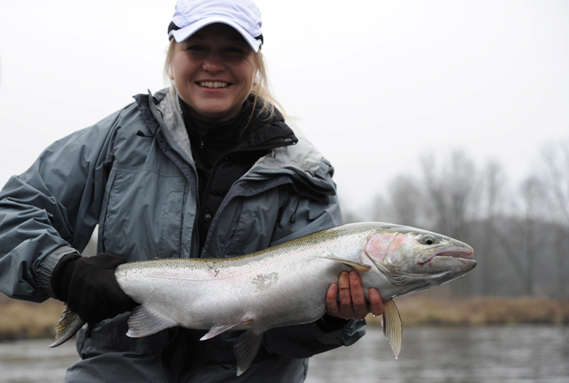 Come and experience the hot steelhead action that’s available in northern Michigan! Aaron with a beautiful steelhead hen that we caught while wading. Winter steelhead action can be downright hot!